Ghosts and goblins and spooks. Oh my! Black cats and witches and bats. Oh my! It’s haunting season! I’m all about the ghoulish food – the witches fingers cookies and the peeled grape eyeballs and all of that. So, I was super excited to try to make vegan, grain-free, cane sugar-free gingerbread cookies with black sesame seeds. Black sesame seeds! What a perfect Halloween ingredient right?!? The dough was eerily black. Nice and spooooooky! Unfortunately, black sesame seeds turn brown when baked. Ah well. They still taste good. And, it’s yet another entry into Ricki and Kim’s October SOS Sesame Challenge. In a coffee grinder or high-speed blender, blend the sesame seeds until you almost have a paste. (You’re not going for creamy tahini here – just all ground up.) Set aside. Grind the chia seeds. Mix with hot water until a gel forms. In a large bowl, beat the coconut oil until smooth and fluffy. Add the sesame paste and chia gel and beat well. Add the syrups and spices & vanilla and blend well. Add the rest of the ingredients and mix until well-incorporated. The dough will be very sticky. Put it in the fridge and chill it – the longer the better. When the dough is well-chilled, heat the oven to 350°. Remove a small ball of dough and place between 2 sheets of parchment paper. Roll out to 1/4 inch thick. Remove top sheet of parchment paper. Cut with cookie cutters, dipped in potato starch or coconut flour. This dough is NOT easy to work with, and it gets worse when warm. So, work quickly and carefully. Place cut cookies on a parchment-lined cookie sheet. When you get sick of fighting the dough, you can roll it in small balls and flatten it with the palm of your hand for a more traditional molasses cookie shape. Bake for 12-15 minutes. Do not underbake – they will not hold together. Like most gingerbread, these taste better after a day or two. They’ll soften slightly and the flavors will meld and they somehow taste sweeter…. The "I'm sick of rolling out dough" version. For more slightly indulgent recipes, check out Slightly Indulgent Tuesday. For a host of healthy recipes, check out the Hearth and Soul blog hop. This entry was posted in cookies, Cooking Challenges, holiday, sesame. Bookmark the permalink. THANK YOU … gingerbread season is around the corner and I really don’t want to experiment. I will give this one a try. Let me know how they turn out for you, Lexie. I think if I weren’t interested in rolling them out, I might try to leave out the potato starch. I’ll probably tweak this recipe for a sesame seed free version for the Xmas holidays. Gingerbread and ginger snaps are a big deal in my household. Oh, these are great!! Going on my ever expanding list of things I want to make for the monkey! Thanks Brooke! I hope the monkey likes them. My monkey didn’t like them the first day, but after they sat for a day, he was all over them. I’ve been meaning to get out there, but haven’t yet. I’ve not been impressed with the other local GF bakery (which shall remain nameless). I’ve heard good things about Bloom, though. Thanks for stopping by my blog! Nice job! My son has been bugging me about making gingerbread (since July actually! )… I’d love to give this a try. The cat is super cute! Thanks! We did 2 kinds of cats, bats, and moons before I got sick of cutting them out. A grainy recipe would be easier, for sure. But, if you want to go grain-free, these work! MMMMMMMMM,…your cookies must taste amazing & wonderful too! The “sick of rolling out dough version” -LOL! 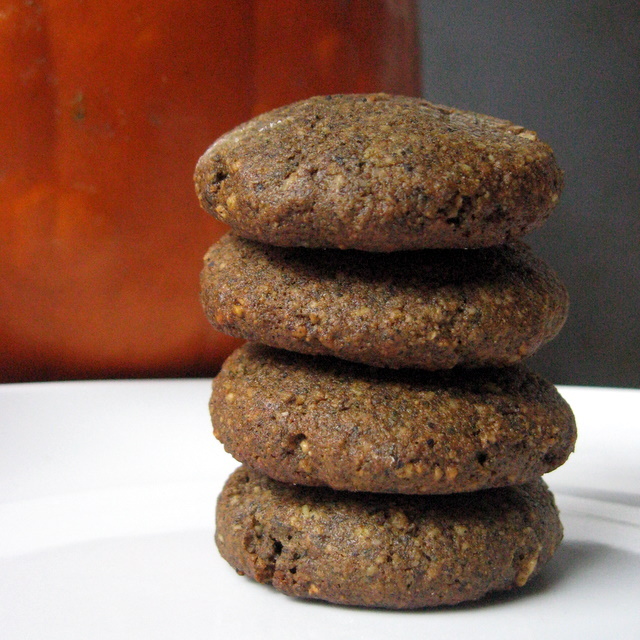 Great idea to add black sesame for Halloween cookies- maybe sprinkling some on top to make them more black! These cookies look so neat. Those black sesame seeds are a nice touch. 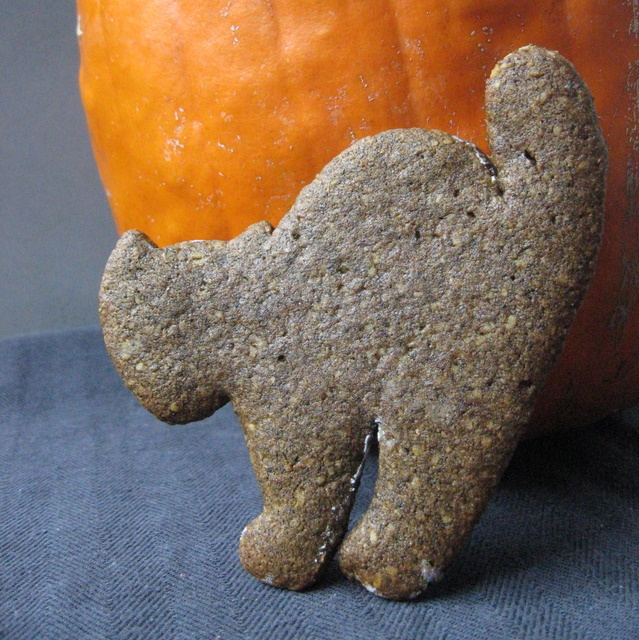 Hooray, I love a good Halloween recipe. Such a great idea to use black sesame seeds, great for the season, and they taste good too. What a great recipe for the Hearth and Soul hop, thanks for contributing. These cookies look great, and I love your creative baking techniques! Nicely done, can’t wait to bake some of my own! My mom and I made these today as an alternative to cut out sugar cookies for Christmas. We had no problem getting the dough to roll out well! Love anything with chia. I might try these with a little less agave and molasses. So glad you liked them. I haven’t tried them with less sweetener, but I think they would work. Let me know if you try it.